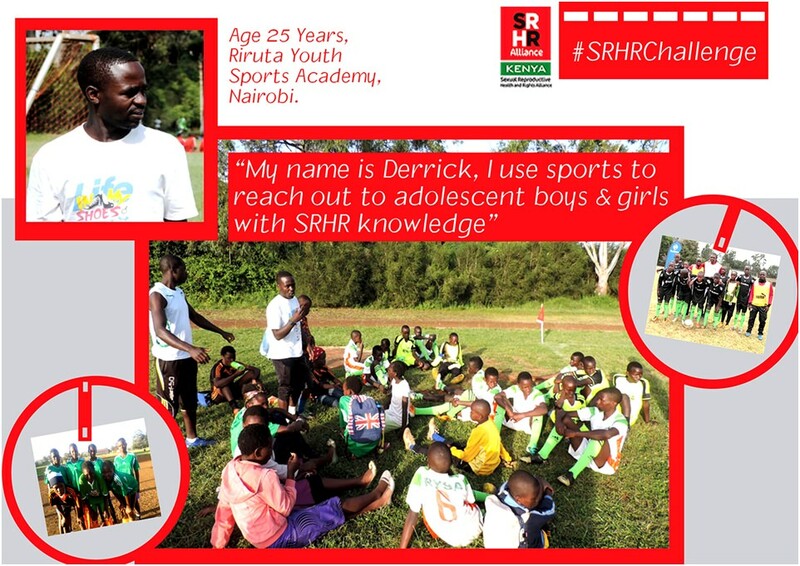 Sports & SRHR Knowledge #SRHRChallenge! My name is Derrick Hamu and I am core founder at. RYSA FC (RIRUTA YOUTH SPORTS ACADEMY/ASSOCIATION)) which is a community Soccer talent club and Academy.The club has existed for over a decade and it has acted as a platform to nature and shape soccer talent in children and youths. The club uses soccer for social and community development as well as addressing issues that put young people at vulnerable state. I Champion for child education, Abuse of drugs, Issues of adolescent / SRH and spreading the message of peace through soccer. RYSA is located in Riruta, Dagorretti South Constituency in Nairobi County. Nairobi County has a population of about 4million (National Census, 2009) with 30% being below the age of 15. This significant youthful population has a lot of implications on the County health and development agenda. RYSA targets adolescents and young people between the age of 10-24 years with sports as a way to harness and promote the development of their talent by playing soccer. RYSA uses soccer to actively engage young people in physical activities and competitive leagues throughout the year. Over the past, RYSA has had partners to further tap on the talents of young people and has established a division for music and acting. However, the Sexual Reproductive Health of this group of young people involved in RYSA has not been fully addressed. It is for this reason that RYSA has established a department within its structures to introduce Sexual Reproductive Health and Rights education as a component in the sports and music development. RYSA has a team for both boys and girls. We aim to give this young people regular information on their sexual reproductive health and link them to service with nearby health facilities. It is our desire that this knowledge will empower this young people and make them agents of change as they educate other young people who might not be directly reached by RYSA. Story submitted by Derrick Hamu for the SRHR Challenge!